The pleasure in riding trains is derived purely from the physical experience of riding on trains. I can only imagine how good it must have been when the herky, jerky steam engines ruled the planet. But even the smooth-running diesel engines of today with the beshocked cars still give pleasure in the way they yaw and chuck along their way. On Saturday I rode the Alaskan Railroad 100 miles north to the town of Talkeetna. The journey, while short, is a phenomenal experience in an increasingly rare form of travel. The conductor pops his head into the station and yells, “Goooooooooood, mooooooooorning,” to a sleepy group of passengers. He barks out a series of instructions, and like good farm animals, we corral ourselves through the doors toward assured shelter. He’s done this, this railroad, for 40 years. It’s his life. He checks his gold pocket watch regularly to make sure the train is slightly behind schedule. For people who rely on the train as a way of life, it wouldn’t be a good idea to be right on time or, God forbid, early. 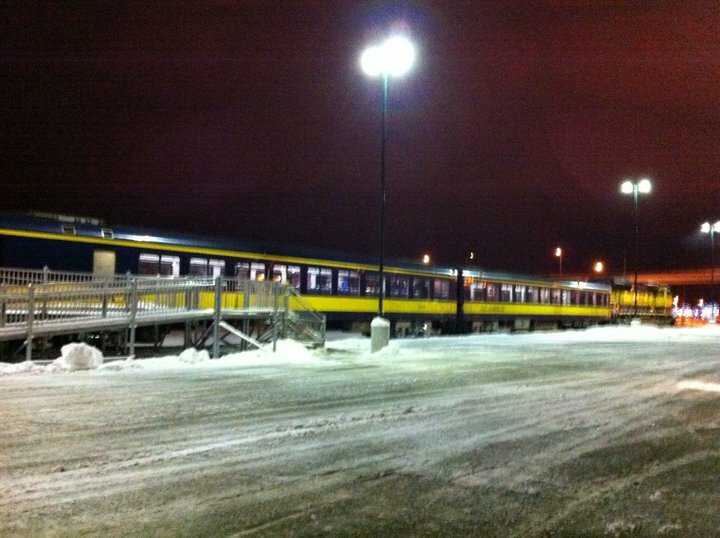 This is the last whistle stop train in North America. A whistle stop train is a very particular form of transportation for a very particular person. The kind of person who wants to live out in the wild. A wild so wild that only a railroad passes nearby. These people ride many miles on snow machines to catch the train into town or down the tracks to a neighbor’s house to fix a problem. Along the way, the conductor tosses a newspaper out every once in a awhile when he knows someone will find the orange bag containing this week’s news updates along side the tracks. 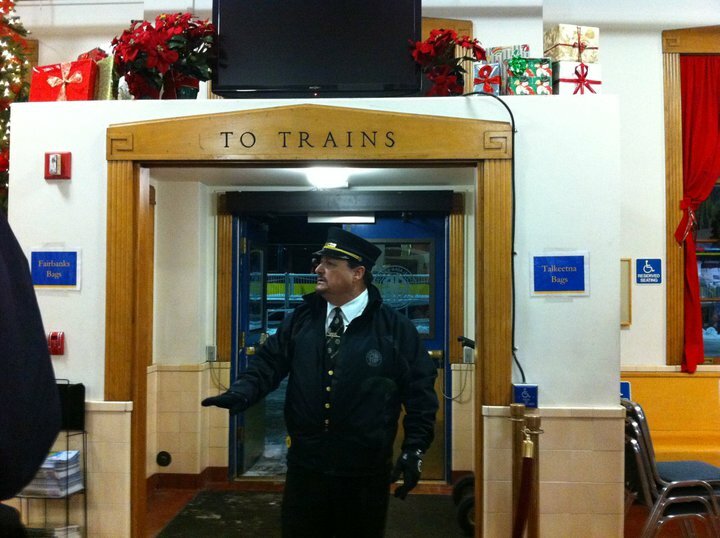 Along the way he welcomes passengers for whom the train is no novelty. Their belongings are not tourist bags or traveler’s packs. 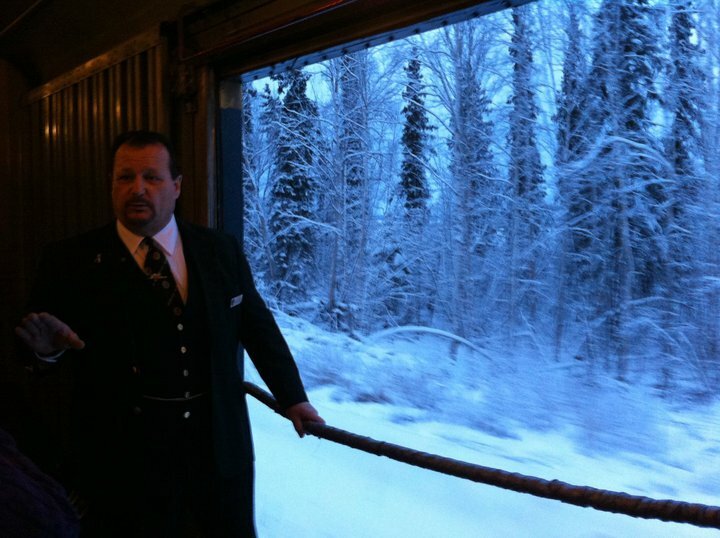 As we disembark the train in Talkeetna, he wishes us a fond farewell, by name, each of us, with a smile. As we walk away from the train into the quaint little valley town, he checks his pocket watch and hops aboard the train for the nine-hour journey to Fairbanks. Into the cold, cold north. Chugging along and telling stories and hearkening back to a better time when travel was as simple as the monstrous engines that carried us here and there. Oh how lovely that must have been! Wonderful post, as always. Your adventures are always a delight! The train ride sounds like it would be such fun. Love the pics.